The books you read when you're young are an important part of your formative years. 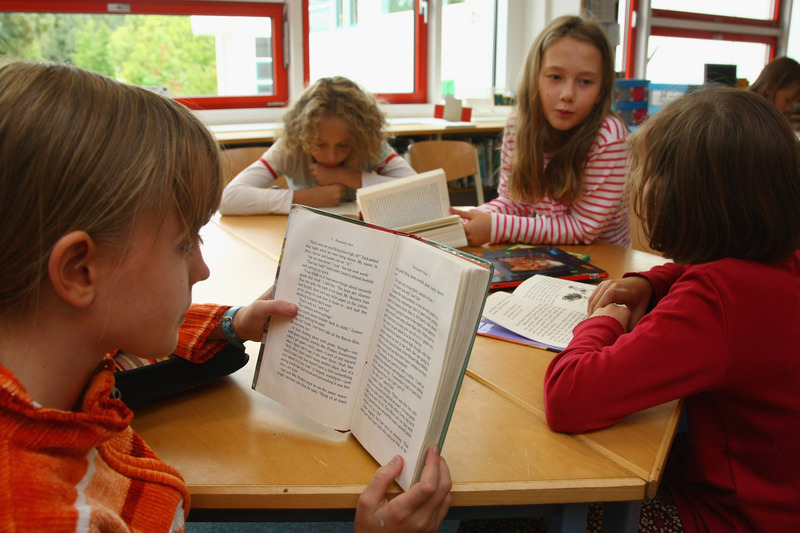 It's true that children who grow up with exposure to books are more likely to continue reading later on. In fact, I'm willing to be Exhibit A and tell you for certain that it's true. I mean, there are tons of children's books out there, and kids today have more access to them than ever. But there are a select few that have staying power. Where the Wild Things Are, The Giving Tree, and The Rainbow Fish are all classics most of us grew up loving, and they stick with us for a reason. But chances are that you read a lot of books when you were a kid. They were read to you, taught to you, given to you as the boring birthday gifts you long for now. Along the way, some of those books have been forgotten. It's bound to happen. They just slipped through the cracks and disappeared like all of those bobby pins you know you bought but CAN NEVER FIND. It's OK — we're all in the same boat. Wouldn't you like a reminder, though? Something to refresh your memory, and help you relive your childhood? Sure you would, and that's what I'm here for. Here are 21 classic books I'm willing to bet you read somewhere along the line between Kindergarten and middle school. Don't remember one or two? It's possible you just had A Bad Case of Stripes that day! This tiny bat was a childhood classic. Stellaluna was her mother's pride and joy, but falls out of the nest and *gasp* comes to live with a family of birds who try to raise her as one of her own. The anxiety in the classroom was palpable as we all waited to see if Stellaluna would be reunited with her mother. I hadn't thought of this one in forever, but I'm glad to see it still gets attention, even today! It's a simple enough story: the lower case letters of the alphabet climb up a tree, fall out, and get hurt. The capital letters have to go after the pesky lower case letters, and describe their injuries along the way. This was a fun one to have read to you as a kid. The rhythm of the words flowed so well together, it was almost like a song, perfect for listening to around that kindergarten carpet. Camilla loves lima beans, but didn't want to eat them because her friends didn't like them. Not wanting to stand out, she stops eating her beloved beans, and one day wakes up with — you guessed it — a bad case of stripes. Now she can't help but stand out. Would Camilla go back to normal? Was it really possible to wake up striped? This one raised all the page turning questions your elementary mind could come up with. Louis Sachar is mainly famous for Holes, another elementary school classic. But that often means some of his other books kind of... fall by the wayside. Wayside School is Falling Down is the second in the Wayside School trilogy, which were some of the most popular, fun books to read along with your classmates once you were old enough to do so. The shenanigans of Wayside School were just so much more interesting than your own! I could probably open this book again right now and immediately be able to feel the snow on my face. Snow was magical then and now, and would probably still make you wish for a snow day. The illustrations were really what made this one stand apart, and the second winter comes, it pops up on winter reading lists and holiday themed lists everywhere for good reason. You wanted this book. You had to have this book. For one reason only: it came with the necklace. Looking back, my phobia of spiders likely started with this book. Sure, he's a nice spider, but that cover is terrifying, frankly. What were our teachers thinking, reading this aloud to impressionable children? Oh, yeah, morals. Silly parables, spiders are for running from! A middle school classic. Hatchet made you realize how little you knew about survival, made you picture yourself alone in the woods with only a hatchet, and made you question everything. Seriously though, looking back, what 13-year-old kid could do what Brian did given the circumstances? Oh, and this totally set us up for our future love of Lost. Poor Harry, he was just tired of baths. We could all relate to that as tiny children, I'm sure. But Harry is so fed up that he takes his brush and runs away! He comes back so dirty that his family didn't recognize him. Alas, another bath was in his future. As the 50th anniversary stamp indicates, this one will never get old! The essential book on friendship for little kids. Frog and Toad did everything together, helped each other through problems, and knew how to cheer each other up. There were several in this series, but this is the essential childhood #throwback. Stargirl, Milkweed, Loser, Jerry Spinelli was a middle grade writing superstar. Maniac Magee was about Jeffrey, aka "Maniac" was was an orphan looking for a home. Maniac is known for being fearless and impressively athletic in Two Mills, Pennsylvania. The book deals with racism and homelessness, making this one an importantly powerful pick for middle-schoolers. A book set in ancient China that tries to explain why Chinese sons are given such long names. Tikki Tikki Tembo-no Sa Rembo-chari Bari Ruchi-pip Peri Pembo and his brother Chang are playing too close to the well, and Chang falls in. Problems ensue, to say the least, in what is probably the saddest childhood book we were given. Everyone loved this book around the elementary school years. The Stinky Cheese Man included parodies of famous fairytales (not that we realized what that meant at the time), and never failed to make us laugh. Now a Caldecott Honor Book, The Stinky Cheese Man was released in 1992, and is actually as old as, or older than many of us are! Guaranteed to make you hungry. The end. They're still making these books, but they were new circa 1992. Jack and Annie could climb into their tree house-turned-time-machine and go back in time, in this case, all the way back to when dinosaurs roamed the earth. The series followed with more books, including trips back to the Titanic, Ancient Egypt, and England during the Middle Ages. You probably begged your parents for a tree house of your own after a few of these. This adorable mouse just wanted a cookie. And a glass of milk. And a straw. And... you get the idea. After a mother won't buy her daughter a teddy bear with a missing button, Corduroy, the bear in question, is determined to find his own button. He wanders the department store after it closes looking for anything that will repair his overalls, with no luck. Happily, Lisa, the little girl, comes back the next day and buys Corduroy anyway. Aww! A group of dogs get together to build and race cars in a universe I would still love to visit. This one was probably confused for a Dr. Suess book, given the cover, and was read super-early on. Like, learning colors and opposites early, and it was perfect. The Boxcar children somehow made an incredibly sad subject so readable, especially given the audience. Did you know the series was originally published in 1924? Talk about old books! Orphan siblings are living in a boxcar when they meet the grandfather they had once believed to be cruel. He takes them in — boxcar and all! Brown Bear, Brown Bear, What Do You See by Eric Carle and Bill Martin Jr.
Eric Carle was — and still is! — everywhere when we were growing up. The Very Hungry Caterpillar was his main claim to fame, but Brown Bear, Brown Bear, What Do You See? wasn't far behind. This was another read aloud favorite, and everyone wanted to see what Brown Bear saw! Not just an amazing movie starring Robin Williams! This one made you want to play a board game as interesting as Jumanji. Judy and Peter find a board game at the park and take it home to play with it, having grown bored with all of their own games. The game only ends if you say "JUMANJI!" and no doubt some antics ensued with this one.